My name is Kathy Price and I'm running for public office in New York City. It would be an honor to be elected by our PTA members to become part of the Community Education Council of District 15 in Brooklyn (CEC15). If elected to be a CEC15 member, I will be a clear communicator, community connector, and spirited celebrator. I will help connect CEC15 with the district schools and parents, so there is an even greater sense of partnership and sharing of best practices. I will enhance communication strategies through technology, so schools and parents feel increased access to the CEC, and I will celebrate the successes of our schools, our kids and CEC15. Connecting, communicating and celebrating our community represent several of my core values as an individual. I have the time and availability to dedicate to the CEC and it would be a great honor to represent District 15 as an elected volunteer. Clear communication was the focus of my career for 20 years as a public relations professional. I worked in senior communications roles at The New York Times, CNN and Harper's Magazine. I also have an MBA in marketing from Fordham University. I started working at CNN in 1996, the same year Fox News Channel and MSNBC launched, and part of my job was working successfully within a suddenly competitive landscape where CNN went from being the only 24-hour news network to one of three. When I worked at The Times from 2000 to 2006, I helped strategically navigate the issues surrounding transitioning from being a print-focused and New York-centric newspaper to a digital and international news outlet. At Harper's Magazine, where I was vice president of public relations from 2008 until 2011, I created and established a social media presence for a 160-year-old magazine, the oldest in America. I'll bring the communications expertise of working at some of the most-respected media companies in the world to the CEC. I will confidently speak to multiple stakeholders, amplify the voices of District 15, and make sure our community feels heard on important issues and developments that affect our district. I also value communication on a personal and community level. In 2013, I spoke up and helped make 9th Street safer by proposing to CVS that they create safety signage for their parking lot's driveway. CVS agreed to implement my ideas and I worked with their corporate leadership team to create signage to alert drivers and pedestrians to the hidden driveway, helping the hundreds of people who walk on 9th Street every day. Community is critical. 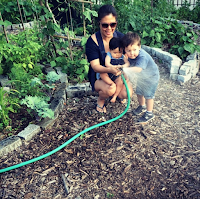 When my oldest child was 2-years-old and my youngest child was an infant, we began volunteering at the Park Slope Senior Center and the Old Stone House gardens on a weekly basis, which we continue today. I want service and connectedness to be in my childrens' DNA the same way my dad instilled in me at an early age, the spirit of giving back to the community. With regards to education, there is now more incentive for schools to share best practices, whereas in the past, schools were encouraged to be competitive with each other. I will seek out opportunities for schools to share information and strengthen ties to each other and feel that same sense of community. With regard to our families, stronger parental engagement leads to a stronger community, so as a CEC15 member, I will advocate for more parental participation. I stand for equity, I'm an advocate for all kids and I believe strongly that social/emotional development is imperative to student achievement. These are values form the foundation of community building and are the values that will inform and guide me whether the CEC is addressing issues surrounding testing, school siting, overcrowding, classroom size, or school funding. I also take time to celebrate accomplishments, which fosters a sense of community and boosts morale. After persisting and working with the New York City Department of Transporation for two years, I celebrated when we got the speed humps that I requested for our block. On the day the humps were installed, I made a cake in the shape of a speed hump to thank the DOT. As I wrote on my blog, I wanted to celebrate the workers and make the experience memorable for my kids. Council Member Brad Lander tweeted about the party saying he's pretty sure the party was the most love a DOT crew has ever received, PS 118 thanked me, and local news outlet DNA Info reported on the DOT love. Community Board 6 featured the DOT hump party in their first newsletter of 2016, saying it was refreshing to see community gratitude instead of negativity. As a CEC15 member, I will search for opportunities to recognize when our students and schools reach goals, find creative solutions to problems or create programs we can replicate. I will look for ways to bring cheer to the district as I did when I replaced the "hearts on a wire" over 5th Avenue two years ago. The importance of celebration is underrated. Our teachers, who represent the largest public school system in the country, are charged with giving our 1.1 millions kids the academic, social and emotional skills to work one day and to be citizens in a democracy. I am eager to take my commitment to our teachers and community to the next level with a leadership role in our CEC. I have the dedication, the energy and the time to commit to this important role. Thank you for considering my candidacy to represent district 15. If you are a PTA officer, please let me know because I'd love to tell you more about why I'm the best candidate for CEC15. If you are a parent of a student in District 15, please consider engaging your PTA officers about the upcoming election and let them know who you'd like for them to vote for. There are 43 schools in our district and three PTA officers at each school is able to vote for two candidates in the election from April 23 to May 9, 2017. With only 130 or so total eligible PTA voters, every vote counts. District 15 is comprised of the following neighborhoods: Park Slope, Gowanus, Windsor Terrace, Kensington, Carroll Gardens, Cobble Hill, Boerum Hill, Sunset Park, parts of Red Hook and parts of Fort Greene.